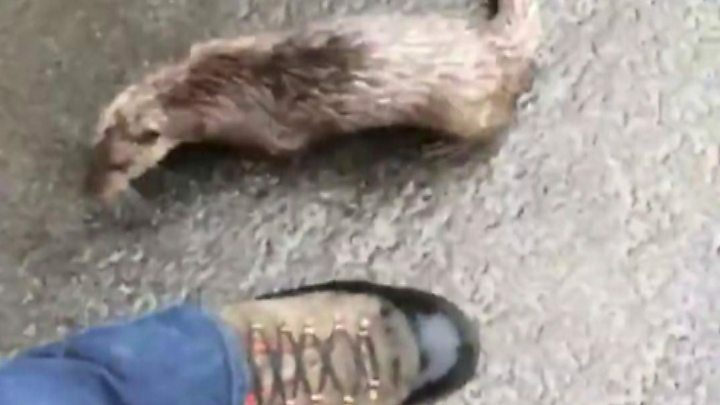 A forestry worker filmed the moment he was chased by an otter after he discovered it on a road in Dumfries and Galloway. Rory MacPherson's video has now been viewed tens of thousands of times on Facebook. In it he can be heard laughing as the wild animal tries to bite his feet. But when the 24-year-old tries to escape to his car, the otter follows him at full pelt, and he shouts: "I'm being chased by an otter!". Mr MacPherson, from Lockerbie, said he came across the animal "jumping about the road" near the Kagyu Samye Ling monastery at Eskdalemuir on Monday. He told the BBC Scotland news website: "I nearly hit him with my car so I pulled to a stop, got out and it was still there and I tried to get closer. "I don't know what made it go a little bit crazy." The harvesting manager for Scottish Woodlands added: "It's not often you see an otter, never mind get the chance to photograph it. "I assumed it would run away pretty quickly but I got a little bit more than I expected." He said the otter had "huge" teeth and it was definitely biting his feet - but fortunately they were protected by his sturdy boots. "I thought, how is this going to end?" he said. "It wouldn't leave my feet alone. "I thought I'll run away and hopefully it won't catch up with me. It's made for a funny video."